Middle East Perspectives by Rick Francona: A ceasefire in southwest Syria - genesis of a Trump Administration policy on Syria? A ceasefire in southwest Syria - genesis of a Trump Administration policy on Syria? The United States and Russia have agreed to a ceasefire in southwest Syria which will take effect at noon on July 9. Jordan and Israel are also parties to the agreement. No additional details were released. Any ceasefire in Syria is welcome, even a limited one such as this. Southwest Syria has been the scene of ongoing three-way fighting for months. The combatants are the Syrian Army supported by Iranian and Hizballah forces, an Islamist group who has declared itself part of the Islamic State in Iraq and Syria (ISIS), and opposition elements of the Free Syrian Army (FSA). 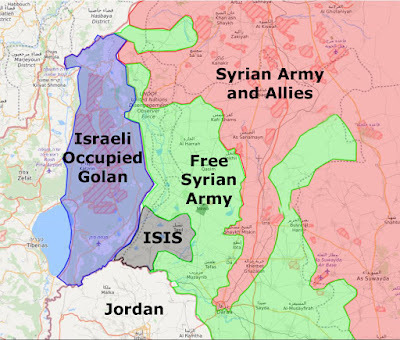 On several occasions, artillery shells fired from Syria have struck Israeli positions in the occupied Golan Heights. The Israelis have responded with artillery fire and air strikes against Syrian military and/or ISIS positions in retaliation. Israel is concerned with the deployment of Iranian Islamic Revolutionary Guard Corps (IRGC) forces and Hizballah fighters opposite the Golan Heights. News reports have shown Iranian and Hizballah flags visible from the Israeli side of the United Nations zone that separates the Israeli-occupied Golan from Syria. Iranian officials have claimed this IRGC deployment will be a permanent garrison opposite Israeli positions. Syrian Air Force fighter-bombers have attacked FSA targets across the border in Jordan, although the Syrians claim the attack was the result of pilot error. Both Israel and Jordan are concerned about being drawn further into the six-year old Syrian civil war. Ceasefires in Syria do not have a history of success, and I doubt this one will be an different. ISIS is not a party to this agreement and could be the spoiler. It may hold in the city of Dara' where the combatants are the regime and the FSA. That said, the important point is that the United States and Russia are talking to each other directly about potential solutions in Syria. The willingness of the United States to engage with the Russians over Syria may indicate the genesis of a long-awaited Trump Administration policy on Syria. Despite all of the political posturing by other regional powers - Turkey, Iran, Iraq and even the Syrian regime of Bashar al-Asad - the main interlocutors for a solution to the civil war in Syria will be the United States and the Russian Federation. It is high time that these two major powers came to terms with the fact that any solution in Syria is going to require American and Russian cooperation and leadership. Perhaps this is the start of that effort. After the recapture of Mosul, what's next?